Allis Roller is making big strides in process improvement, as well as leadership. The company’s most recent addition to the team is Russ Dudan as Vice President of Operations. Russ comes with a unique combination of engineering qualifications, leadership experience, and international business acumen. Having served as Operations and Engineering Leadership, General Management, Business Development, and CEO/President over the course of his career, Russ possesses a diverse professional background. He has managed multiple operations and built relationships with Fortune 100 companies across Europe, Asia, South Africa, Australia, Canada, Mexico, Brazil, and India. Russ’ ability to foster organic growth through workforce synergy and a lean manufacturing philosophy is what makes him an effective manufacturing leader and team builder. 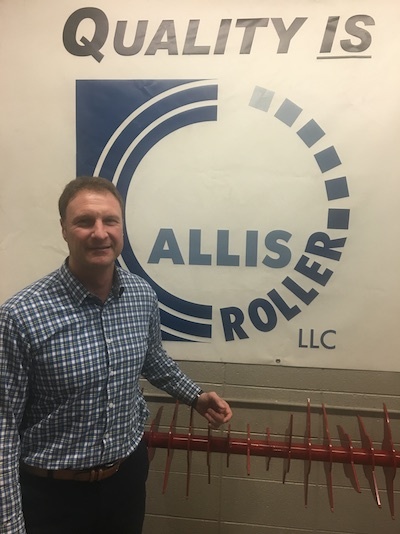 With credentials in Lean Six Sigma, Kaizen, process auditing, and strategic planning, Russ helps to keep Allis Roller solving problems, achieving excellence, and growing sustainably. What drives you in your career in promoting continuous improvement via “people, processes, and technology”? I am very driven by the satisfaction I get from guiding a team to identify things that could be better and then working with them on improvement. The people, process, technology model is nothing new, but it the best and easiest method for driving sustainable change. The basis is that people drive your business and are at the foundation of the improvement pyramid. No matter how good our processes or technology are they will not be effective without the right people. Furthermore, applying good technology to a bad process only helps by creating more waste more quickly. I’m most passionate about creating high performing teams. Having great people in the business is a first step. Then, people need to have a vision of where the company wants to go and to see how they fit into the vision to drive alignment of team and personal actions. I have great satisfaction from seeing a team of people that trust each other working together to arrive at a common goal. What programs or initiatives do you see Allis Roller engaging in under your leadership over the next 9 months? Allis Roller is a great company with great opportunities for growth. I’m impressed with the people here and much of the work they have already done. Many have been here a long time and have a lot personally invested to get Allis Roller to where it is today. The first step is generating clarity for what we want our business and shop floor to look like. Then, close the gaps to the vision through focused improvement events, lean manufacturing methods, implementation of cell standards and metrics, workplace organization, and people development. What do you feel about your background has prepared you the most for your new role at Allis Roller? I have a unique background with engineering, operations, project management, sales and account management, and business leadership. I believe an understanding of all of the business functions has prepared me well for this challenge. I will draw heavily from my background in design, fabrication, and machining of weldments and components along with my experience of cellular manufacturing and shop floor improvement. Ultimately, the most valuable skill set will be to create clarity around our vision and build teams to facilitate changes to meet our operational goals. What are some “fun facts” or personal information about you? This can range from family life, to pets, to your hobbies, to where you like to vacation – anything! My wife, Suzanne, and I have two children, 13-year-old boy and girl twins. Both are active in sports and I spent much of their younger years coaching their teams. Now, our hobby seems to be traveling with them to their sporting events. In our free time we enjoy golf, travel, and relaxing at a movie. In my free time I enjoy running, fishing, being outdoors, and working around the house.